Nike Sportswear appears to have an upcoming Nike Air Max 95 Graphic Prints colorway set to release later this year. While the official theme has yet to be revealed by the Swoosh, we share some detailed images of this intriguing Nike Air Max 95. The highlight of this release is seen on the overlays of the shoe’s upper that features a variety of wild graphic prints extending to the back heel in a range of painted patterns. 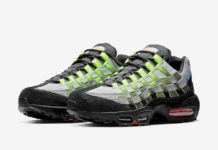 As of right now a release date has yet to be confirmed, but we do give you a first look at this upcoming Nike Air Max 95 colorway. Let us know if you guys are feeling this Air Max 95 in the comment section and stay tuned to Sneaker Bar for further updates as they develop.